We recommend scheduling your child’s first dental checkup by his or her first birthday. At this early of an age, we can start to monitor and evaluate their oral development, screening for concerns so that they’re easier (and more comfortable) to fix. In addition to treating tooth decay and chipped teeth, we work with parents to develop effective oral hygiene routines that promote better dental health as their child grows up. 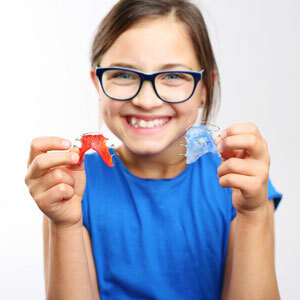 When necessary, we’ll provide additional orthodontic intervention to correct bite discrepancies so that more complex treatments aren’t necessary once your son or daughter is older. A child’s first dental visit is a relatively simple one. In addition to familiarizing your little one with our office, we’re set on making a great first impression that’s as non-confrontational as possible. In most cases we will have your child sit in your lap so that we can quickly examine his or her teeth, then discuss any specific concerns. As your child gets older, we can incorporate steps like preventative cleanings, X-rays, sealants and fluoride to encourage healthy tooth development and a cavity-free smile. We work at your child’s pace, gaining their trust a little more at each visit. Book your first visit online or call today to schedule. Our paediatric dentist is available to see patients on Saturdays.